I learnt to Ski in 1990 at Sheffield Ski Village, however, did not then ski between 1994 and 2007. I then joined Sharks Ski Club with my 2 Children and with the assistance of the superb coaching/instructor team in 2011 I undertook a Snowsport England Level 1 Course. In 2012 I qualified as a Snowsport Scotland Alpine Ski Leader. I then started to realise my dream and how rewarding the role of a Ski Instructor can be. 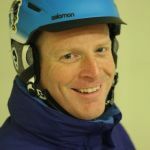 In June 2013 I qualified as a BASI ( British Association of Snowsport Instructors) Level 1 Instructor and in May 2014 achieved a further part of my dream by qualifying as a BASI level 2 instructor. At the time of writing (july 2014) I have over 400 hours of teaching experience and am working towards my BASI level 3 award. I am employed as a part time ski instructor at Chillfactore but still manage to give up my Saturday mornings to be part of an amazing Ski Club.